A programmable vibrating metronome/beat box with a flamenco clock display. 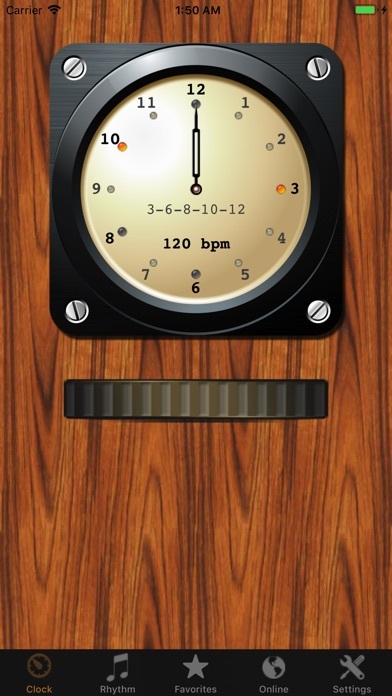 The only metronome that lets you practice Subida (tempo change) and share rhythms online. Beat Vibe is both a vibrating metronome and a programable beat machine aimed at both the flamenco player and non flamenco musician. Beat Vibe is pre-programmed with over 50 rhythm patterns from all major palls such as Bulerias, Alegrias, Tangos and more, including non-flamenco rhythms like Samba, Bosa Nova, Rock, Raggae and many more. You can easily program your own rhythm patterns, share them online, and download from the many rhythm patterns other users have shared. The unique "Song Mode" lets you set a sequence of rhythm patterns to play, setting the number of repetitions and tempo. You can create rich percussion loops or practice change of tempo (subida)! You can set Beat Vibe to vibrate letting you not only see and hear the rhythm but also feel it. Put the phone in your pocket and feel the rhythm as you play. â€¢ Fully programmable, you can program rhythms of up to 16 beats, with precise off beat placement. â€¢ Play a sequence of patterns to create rich songs optionally changing tempo. â€¢ Online database with user generated rhythm patterns. â€¢ Multi-track. Play multiple sound samples. â€¢ Pre programed with over 50 rhythms including: Solea, Alegrias (several), Bulerias (several), Seguiriyas, Tangos, Fandangos, Bossa Nova, Rock, Blues, Mambo, Samba, Cha Cha, Country, Swing, Lambada, Raggae and more. â€¢ Rich percussion sound sample library. Over 50 drum kit and flamenco percussion sounds, sampled in stereo, including: Palmas, Cajon, Tapada, Step, Snare, Bass, Tom, Cymbal, Kick, Timbales, Cowbell, Castanets, Darbuka, Conga and more. â€¢ Volume and vibrate controls (vibrate available on iphone only). â€¢ Add random jaleo calls for extra fun. â€¢ Select from several themes. Watch a video demo on tivstudio.com. Become a fan of Beat Vibe on Facebook.